The BBC News website celebrates its 10th birthday this week – though no exact date can be pinned down according to the corporation. 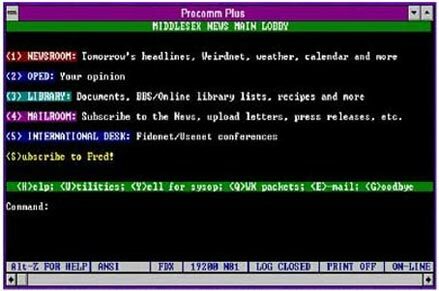 The look of the place has changed a lot in the last decade as this screengrab from December 1 1998, courtesy of the Way Back Machine internet archive, shows (though even then you can get your news in video and audio, and Gordon Brown still manages to top the bill). But the changes aren’t over given the recent goings on at the Beeb: the future promises an on-demand personalised news service, more user-generated content and an integrated multimedia newsroom. 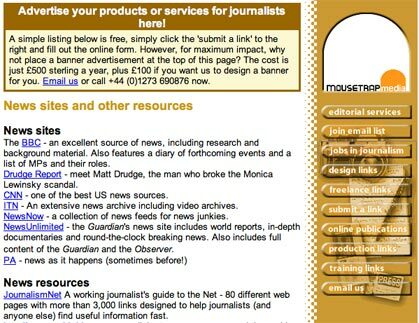 Notably, BBC News Interactive – the department that set up the BBC’s news site – will cease to exist. In his blog, Steve Herrmann, former editor of BBC News interactive and now editor of BBC News website, says the integration process has ‘clear benefits’ for the website. But Herrmann also acknowledges the risks involved. “From my point of view, I am concerned that the editorial coherence of the news website should not be sacrificed in the name of efficiency,” he writes. Shouldn’t integration naturally strengthen editorial coherence? 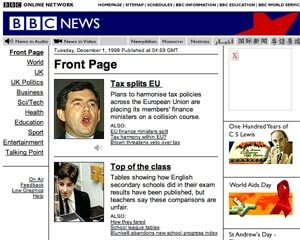 What the BBC News website will look like by the end of this year, let alone by the end of another ten, is anybody’s guess, but what would you keep and what should be the first thing to go? This entry was posted in Online Journalism and tagged BBC News, BBC News Interactive, editor, Gordon Brown, internet archive, news site, Steve Herrmann, the Beeb on October 30, 2007 by Laura Oliver.